GCE-Chess is my second (and final?) 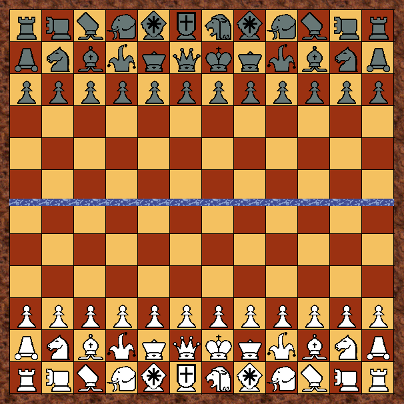 extension of Eurasian Chess by adding pieces from the Courier/Courier-spiel branch of the CV family. It retains all the piece types from Courier Eurasian Chess and then adds an orthogonal equivalent of the Elephant (the Warmachine), as well as a Guard and Champion. It also returns to a square board (12x12) rather than rectangular (14x10). To allow for the increased number of pieces from 16 in FIDE chess to 36 in GCE-chess the board increases to 144 squares. The board density (piece/cell ratio) at commencement is thus maintained at the FIDE 50%. In keeping with the Asian influence a river separates the board between the 6th and 7th ranks. There is however no royal palace to restrict the King and his court. The King however is not permitted to cross the river; a restriction that also applies to the Fool, Elephant, and Warmachine. Kings are also not allowed to occupy the same orthogonal or diagonal if there are no intervening pieces between them. Sliders - which may capture the first enemy piece in their path. Screeners - which move as sliders when not capturing, but must leap over one and only one piece (the screen) when capturing. The non-riders make a single step or a hop (a double step unhindered by any piece occupying the first step. The bi-directional step-hop piece is the Champion which combines the uni-directional moves of the Elephant and Warmachine). The Champion's movement may also be seen as a combination of a step (King or Fool) with a hop in the same direction (Guard). Where the hop changes direction (Horse) from that of the step (orthogonal-to-diagonal) the combination piece is the Sage.